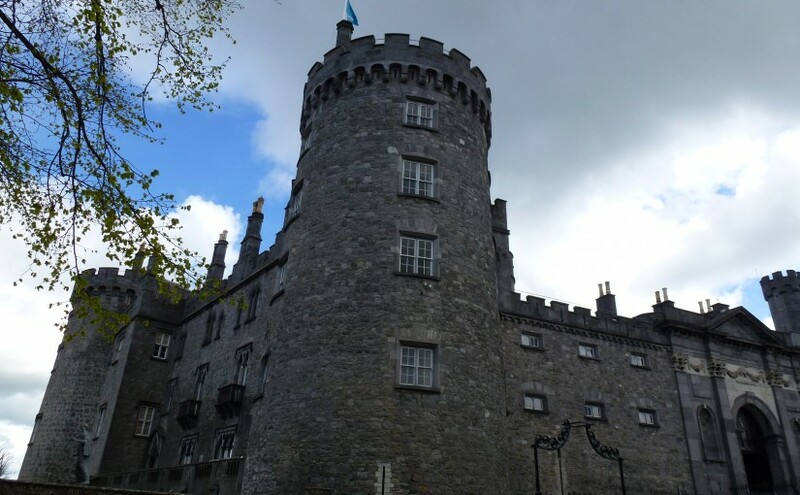 A.B.Reilly has been a genealogical researcher for almost sixty years with particular interests in the O’Reilly, Fanning and O’Brien families from Co Kilkenny, Co Tipperary & Co Mayo and the journeys of their descendants in Ireland and abroad. It is with great pleasure that I publish this extensively researched genealogical paper. 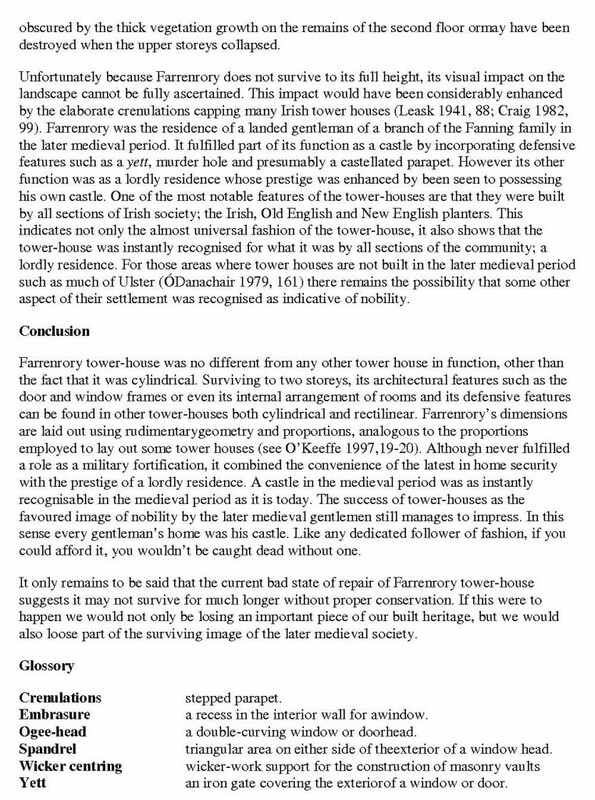 Below is his documented research relating to the descendants of William Fanning of Co Kilkenny & Tipperary. This William Fanning died in 1590. 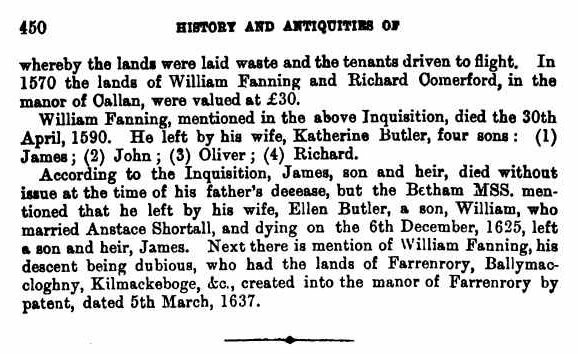 William Fanning II had a son named James Ffaning who was born in 1589 in Knocktopher Parish, Co.
entitled him to settlement in Co. Leitrim. He settled in the Parish of Fenagh, Co. Leitrim. Texas fame was a member of this family. However, the legitimacy of his birth is questioned. Ive-Fermaic. The lineage continues with 3. Donogh O’Brien, of Carruduff, who married Honora, dau. Ireland; he m. Honora, dau. of O’Connor of Corcomroe. James Ffaning had settled and where the O’Briens had settled after the Cromwellian Confiscations. 5. Elizabeth Ann Fanning b. 1698 in Connacht, Greagh Townland, Fenagh Parish, Co. Leitrim. began to learn to play the harp, which was not unusual for a blind person at that time. traditional long finger nails, associated with this profession. Garvagh where Hempson began his musical career. O’Cahan, C. Carragher (John C. Garragher) from Buncrana, Loughlin Fanning and Patrick Conner. 1783. He, also, won first premium of ten guineas at the Belfast Harp Festival held in 1791. Stratton at Drumbibe, Fenagh in 1890. **e James H. Fanning (b. 1853 – d. 1877) married Margaret Farrel ( Sept. 22, 1854 – Oct. 9, 1878) in 1876 in Indiana. They had one child, John J. Fanning. 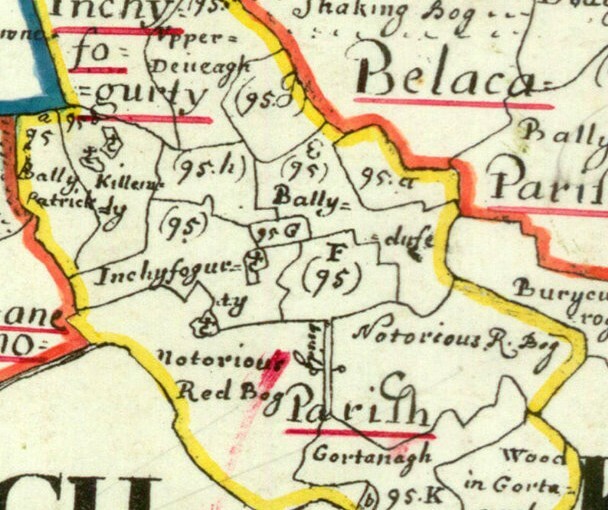 Cullagh in the Parish of Fenagh – born 1830. Henry died in 1886 and Catherine died in 1889.
a. James Fanning b in 1850’s and died in the 1930’s. He married Bridget Geehemn. She died in 1952. 2nd Leo Fanning of Drumigna, Co. Leitrim, who is unmarried & 3rd Frank Fanning of Mohill, Co. Leitrim, who is married with no children. married Chrissie Foley. They had a son named Patrick Colm Fanning. iii. Margaret, daughter of John & Mary Dobson Fanning was born 1826.
iv. Patrick Fanning married Bridget Gannon. He died in 1855. They had a son, Michael fanning b. 1852. Michael had a son, Charles Leroy Fanning who was born in 1902 in Rhode Island. v. John Fanning b. ca. 1830 married Mary Canning. He died in 1916. They had a son, John Fanning b. 1870 who married Rose McCabe. He died in 1916.
vi. Francis Fanning of Glasdrumman. Fenagh, Co. Leitrim. ii. Elizabeth Fenning, born Lower Canada ,1825, died 1911, married John Keany, farmed Lot 11, con. 5. 4 children. 1925 to Anne Kehoe , daughter of Patrick Kehoe & Johanna Fenning. iv. Margaret Fenning , born 1836 in Bytown married John Moran. # 4 Bryan Fanning, son of Laughlin Fanning, Sr. and Ann O’Brien was born about 1693 in Greagh Townland, Fenagh Parish, Co. Leitrim, Ireland. He emigrated to America and settled in Prince George County of the Colony of Virginia probably around 1720 to 1725. He married Elizabeth Unknown. It is not sure whether he married in Ireland or Virginia. Virginia. The old Camp maps show the Tomahitton Creek beginning at the site of the Camp airfield. Carolina, who died in 1825 in Digby, Nova Scotia, Canada. 1736 “A List of all the Titheables below Deep Creek in 1736”. The list was taken by Abraham Green. Amelia microfilm reel #55, Library of Virginia, 1736-1771.
year before Amelia was carved out of Prince George. convenient way & they are accordingly ordered to clear the same. and all other persons convenient and not employed on other roads to assist in doing the Same. WILL OF BRYAN FANNIN AMELIA COUNTY, VA.
intesta of all I have hereunto set Hand seal This 3 day of January, 1765. Certificate was granted her for obtaining a probate in due form. given. Appraisers: Joshua Hightower, Charles Williams & George Hightower. Property Taxes until after the Revolutionary War. male William Fennen), all in Nottoway Parish. books deal with children who were bound out from 1735 – 1782. 1515-1624, ed. J.S. Brewer, and William Bullen. 6 vols. (London 1867-1873) p. 402. J.S. Brewer, and William Bullen. 6 vols. (London 1867-1873) p. 402. Duffy & Co., Ltd., 1911 Author Laffan, Thomas ed. Calendar of Documents, etc., 1285-1292. Sweetman. 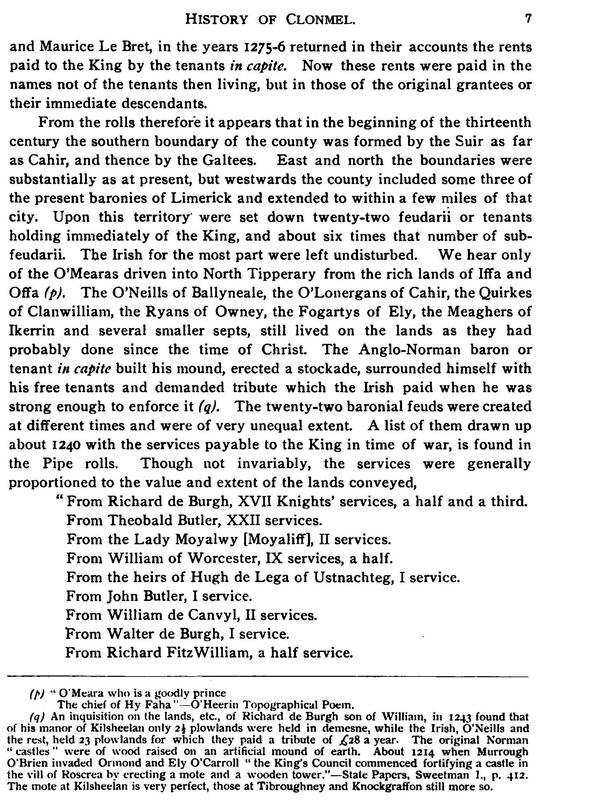 P. 58.
twelfh to the seventeenth century”, Transactions of the Royal Irish Academy, 1828. Union County, S.C. Register of Mesne Conveyance Deed Index Book C Page 199 & others. Memoirs of the Fort & Fannin Families. Kate Haynes Fort 1903. MacGowan & Cooke Co. The O’Briens –Written in Irish in 1762, based on an earlier book by Hugh Buie Mac Curtin. 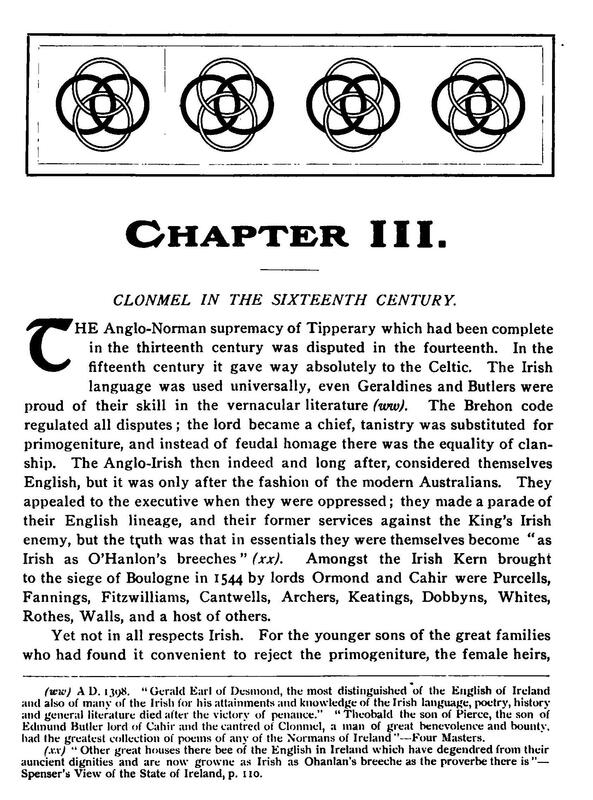 Irish Pedigrees by O’Hart, Volume 1, dated 1892. 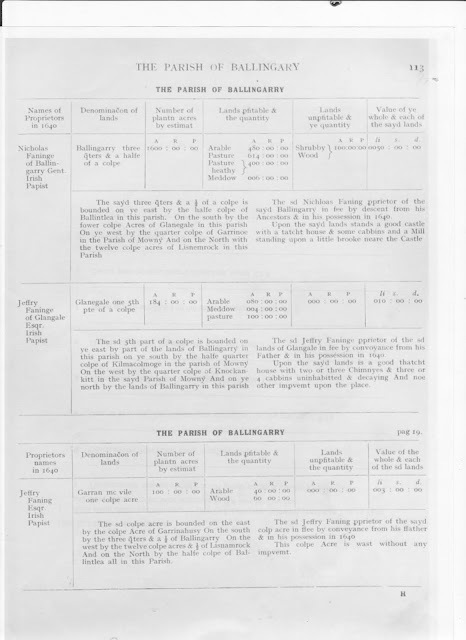 Ballinagleara Parish, Co. Leitrim: Aspects of its History & Traditions. by Padraig Forde. 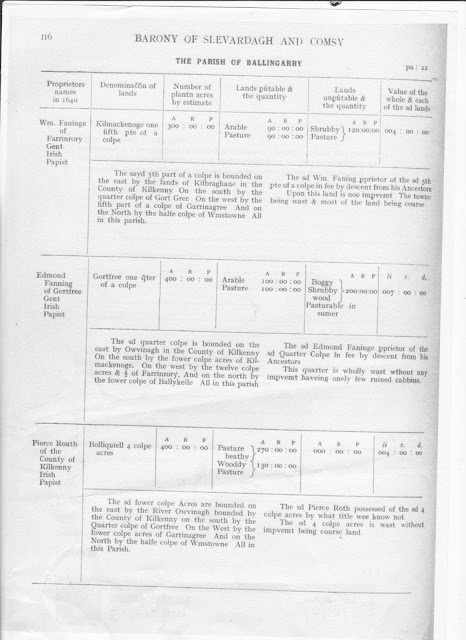 Irish Pedigrees (Heber Genealogies): O’Brien No. 8, Of Ballynalacken, County Clare. The History and Topography of the County of Clare by James Frost Dublin 1893  G.E. volumes, Gloucester, U.K.: Alan Sutton Publishing, 2000), volume VII. “MacUi-Brien Ara,” in Vol H. 1.7, MSS. Lib., Trinity College, Dublin. Ibid. Irish Minstrels and Musicians. Ibid: Irish History in Stone Inscriptions. Annals of the Harpers by Charlotte Milligan Fox. London- Smith, Elder & Co.
Valuation 1851 Co. Leitrim, Ireland. Daviess County, Indiana Cemetery Books – St. Patrick’s Cemetery. J. P. Fanning of Foxfield, Co. Leitrim. received a land grant in Amelia County for 294 acres on Jan. 2, 1737, plus other grants later. LVA-Va. State Land Office Patents, No. 17, 1735-1738, p. 425 (Reel 15) to Bryan Fennin . LVA-Va. State Land Office Patents, No. 26 pp. 484-486 (Reel 24) to Bryan Fanning. 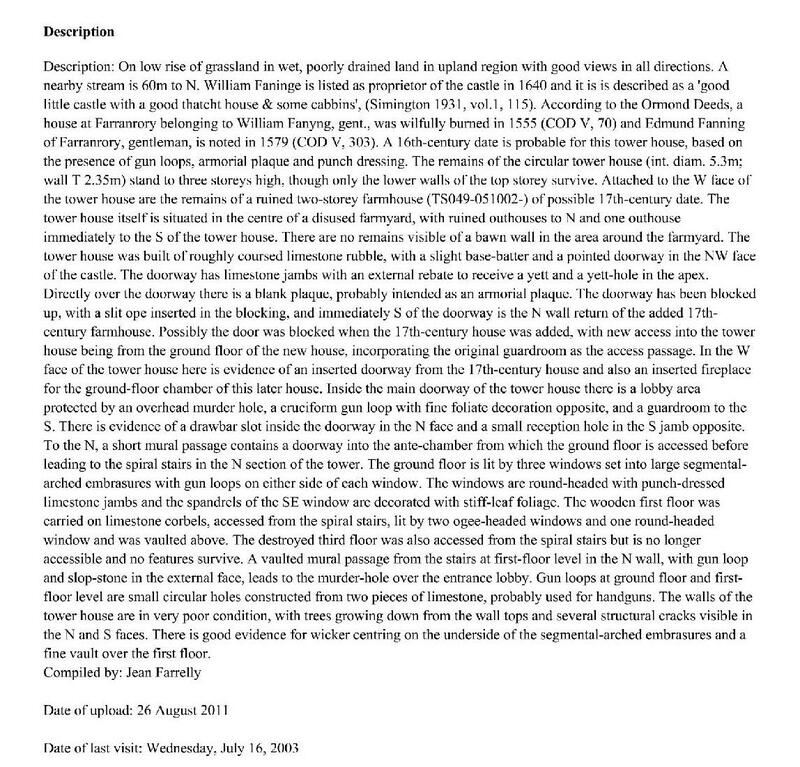 Hunter letter re: U.S. Army Engineers work removing graves at Camp Pickett, Va.
future site of Camp Picket, Va.
Laughling Fannen, Achales Fennen, (other free male: William Fennen 140 Acres), William Fennen. Parents of Edmund Fanning 1620-1683 the Immigrant Fanning Ancestor? Who were the parents of Edmund Fanning of Stonington Connecticut and what is his Irish ancestry?? Lots of folk in America and probably Canada as well can trace their family tree back to Edmund Fanning who was born in Ireland about 1620 and died in Connecticut in 1683. DNA tests as well as family documents have proved these lineages. But in family trees there are several different parents given for this Edmund. So far I haven’t seen any proof or reliable sources to back up what so many have on their family trees. It may be that there is no supporting documents and that we will never know for sure who they were. But if anyone out there can back up his claim as to Edmund’s parents I’d love to hear from you. Or if you have any ideas on the matter please contact me. I have been looking around on the internet and especially in some of the old books on archive.org for references to this Edmund. 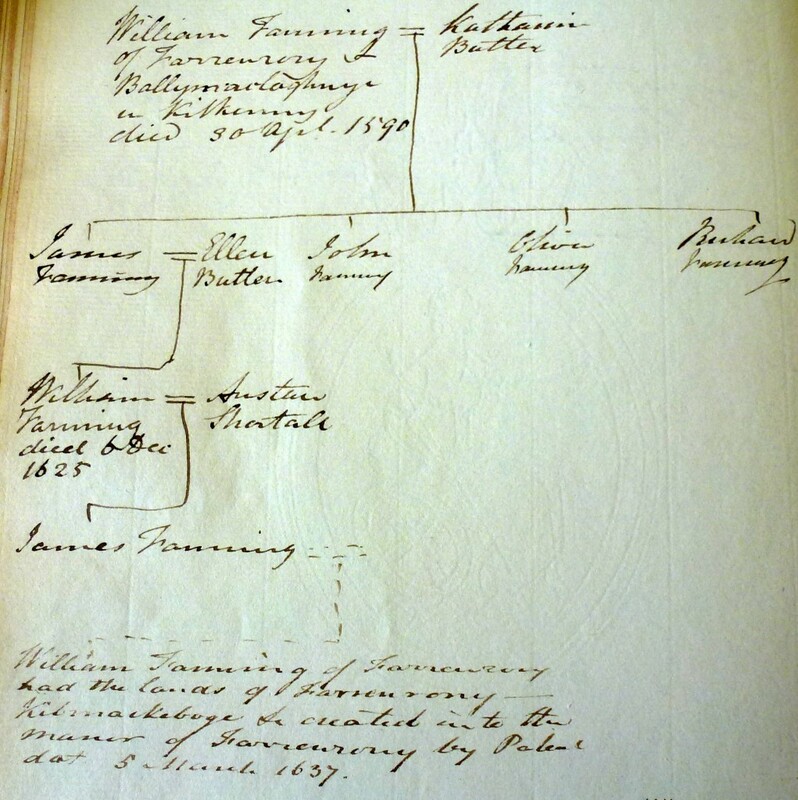 The parents of Edmund are commonly given as Nicholas Fanning and Ellen Cantwell in family trees on Rootsweb World Connect and Ancestry.com. WikiTree has the Parents of Edmund as Nicholas Fanning born Ballingarry, Tipperary Ireland 1593 died there 1653; Ellen Cantwell born Tipperary 1598 died 1699. His father was William Fanning born Ballyclaghin Co Kilkenny 1472 died Ballingarry 1538. There don’t seem to be any sources for this tree. Nicholas Schenck and Walter Frederic Brooks however believe Francis Fanning was Edmund’s father but again it is hard to see why they believe this. The following is a post by Jon Fannon (Dec18, 2008 in Ireland Roots Tipperary) where he gives an outline of what he thinks is the ancestry of Edmund Fanning, the immigrant ancestor of many American Fannings. Walter Frederic Brooks thought that Edmund’s father was Francis Fanning. “At the time of the Confiscations in 1653-54 Francis Fanning’s estates were forfeited, and he received sentence of transplantation to Connaught. 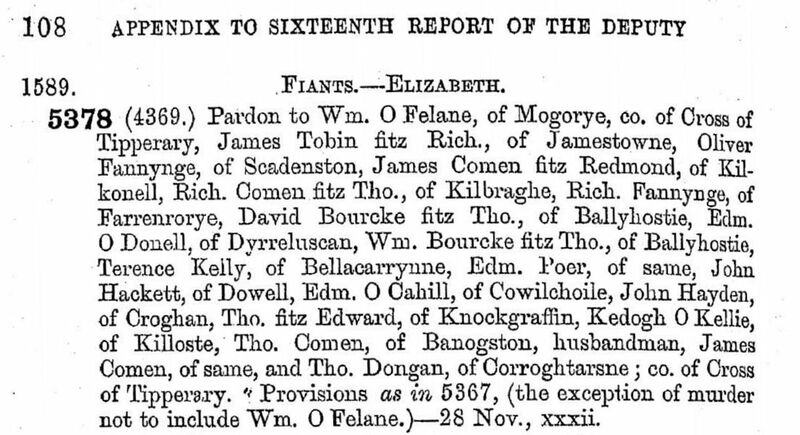 Francis also had a son Edward who also received sentence of transplantation at the same time….his name is given as Edward Fitz-Francis Fanning. This Edward or Edmund Fanning, son of the above mentioned Francis Fanning, ex-Mayor of Limerick, emigrated in 1653 or soon after to America and settled in Connecticut.” pages 31-32 Vol 1 History of the Fanning Family by Walter Frederic Brooks. I do find it strange that Edmund and his children did not call any of their descendants Nicholas or Francis although a daughter of Thomas is called Frances. Edmund named his sons Edmund,Thomas, John, William and James. “The first Fanning who came to this country was Edmund Fanning – born in Ireland in (about)1620 – of the Fannings in Ireland – Limerick, Tipperary, Kilkinny, Clare – the name is on record from 13th Century to confutation under Cromwell in 1652. Vast estates were established to the Fannings. Edmund – the emigrant American ancestor – who settled in Connecticut about 1653 was the son of Francis Fanning, 1841 Mayor of Limerick, Ireland – Connaught Certification Office of Exchequer, Dublin. His name is given as Fitz – Francis Fanning. Fit-Francis means son of Francis – Fitz is French or Norman meaning ‘son of ____’. My interest in Edmund Fanning’s ancestry comes from the fact that my Fanning family here in Australia are linked to this Edmund as shown in a DNA test. So we must be descendants not from Edmund but from his relations who stayed in Ireland. 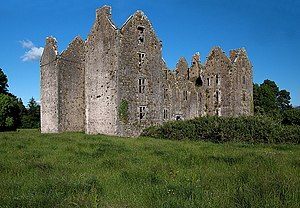 When I was in Ireland I visited Ballingarry and was told about a Fanning castle in Farranrory. We found what is left of the castle and spent a few hours climbing around it and taking photos. Then when I was briefly in the National Library I found a pedigree for the Fannings who lived in this castle. So I would like Edmund to be related to the Farranrory Fannings!! In terms of names in our family Edward and William have been used over and over, never a Nicholas or Dominick and only my grandfather was called Francis, which I think is a bit too far down the track to be relevant. If anyone has any info on the ancestry of Edmund I’d be most interested to hear from you. 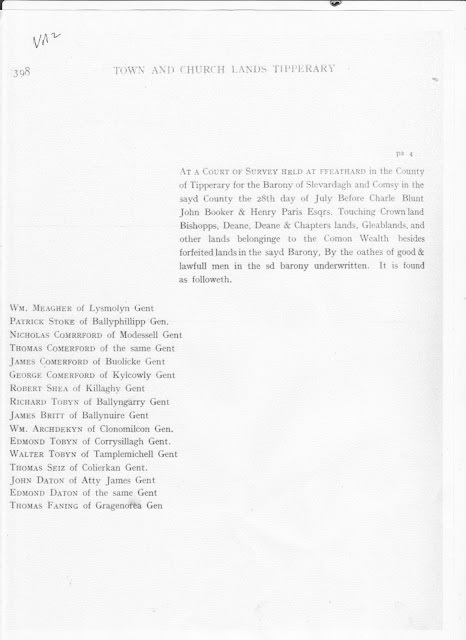 Posted on June 5, 2014 Categories Co Tipperary & Ireland: Fanning, Fannin, Ryan, Sheehan, Darmody, Eviston, Fogarty, Early Irish Fanning Family History Pre 19th centuryTags Ballingarry, Brooks, Butler, Cantwell, Connecticut, Fanning, Farranrory, Groton, Nicholas Schenck, Stonington2 Comments on Parents of Edmund Fanning 1620-1683 the Immigrant Fanning Ancestor? 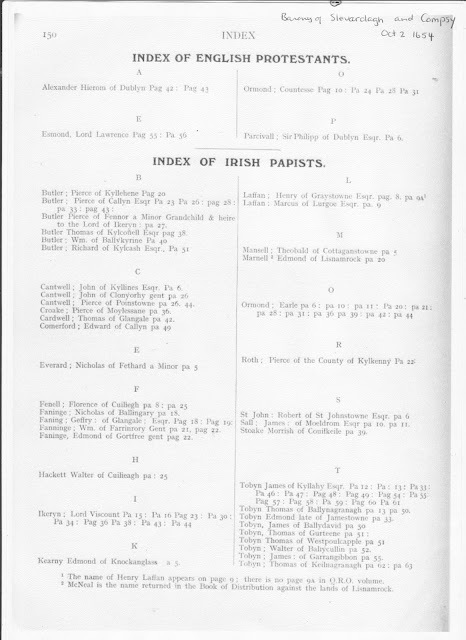 I have just come across a link to the 1641 Depositions held in Trinity College Library in Dublin Ireland. 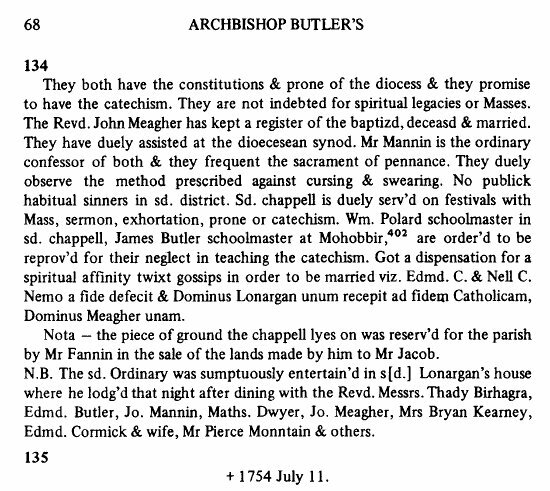 These were statements mostly by Protestants regarding the rebellious activities of Irish Catholics around the time of the Oct 1641 rebellion where the rebels attempted to take over Dublin Castle. One of the surviving medieval towers at Dublin Castle. There are a number of Fannings mentioned in them different depositions. The surname is spelled Ffanning, Fanning or FFanninge. It is possible to look at the original often illegible documents. But there are also transcripts of these papers below which is just as well. So far I have come across Edmond Ffanning in 1642, Dominick Ffanning 1646 and a John Ffanning 1642. Dominick Fanning, the Mayor of Limerick, who was executed by Cromwell features in many as a rebel. You can register for free and also save any you are looking at. The link is 1641 Depositions. 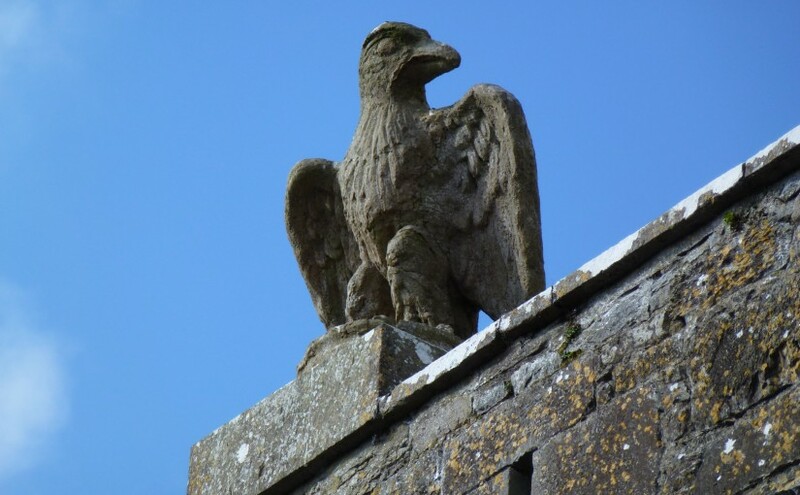 Above are views from Fanning Castle tower house in Farenrory Ballingarry Co Tipperary. 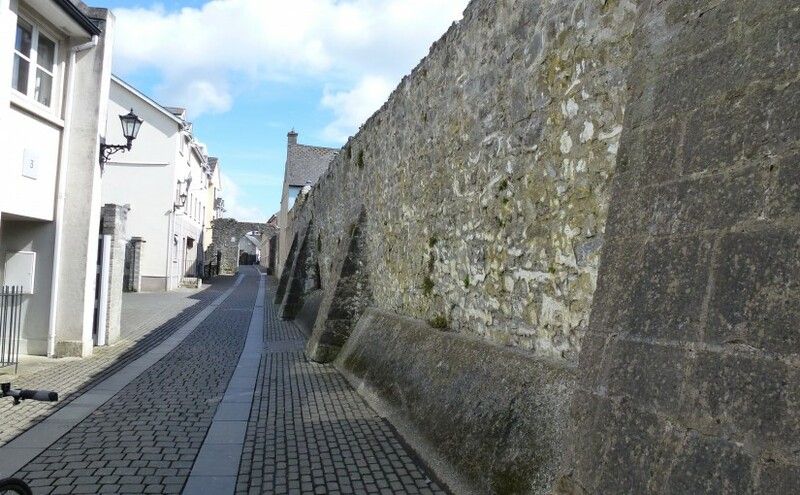 On my recent trip to Ireland and Co Tipperary I thought I would have a look around Ballingarry as there are Fannings documented living there in medieval times. There were different Fanning families at Ballingarry, Mohober, Farrenrory, Garynegre, Gortfree and Glengall. In 1305 William Fanning was leased the Manor, Castle and lands of Mohober. 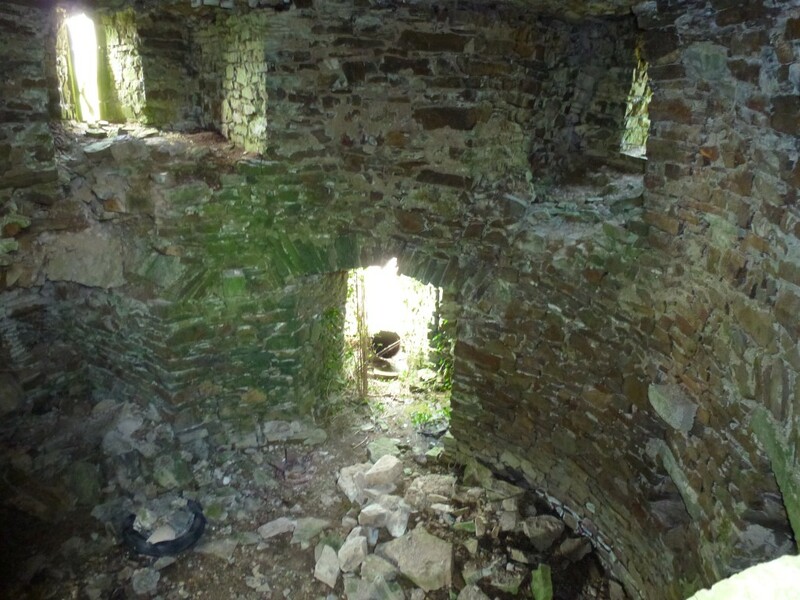 The jurors say that Nicholas Richard and John Fanyng Fitz Geoffery of Ballyngarry, Teige Beare O’Howlaghan and Dermot O’Treassy alias O’Twee of the same, kearns, advised procured and abetted by Geoffrey Fanyng gent, willfully burned a house at Ferenrory conmtaining 40 cows with 60l of William Fanyng gent and also a girl called Sawe Iny Canlyen who was in the house.” From the Calendar of Ormond Deeds. 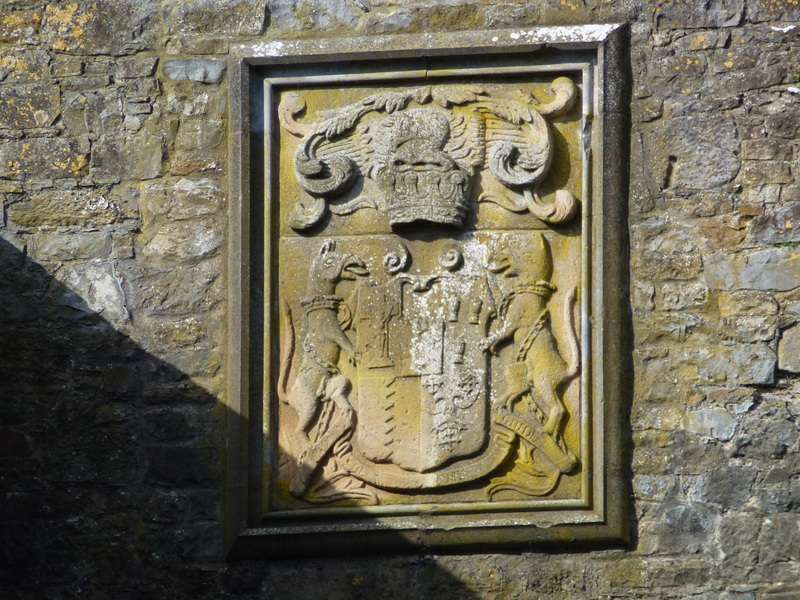 Dec 20 1579 Edmund Fanning of Farrinrory, gentleman, son of William fanning late of the same grants to Thomas…. Dec 13, 1592 Edmund Fanning of Faren Rory is mentioned in a commission. 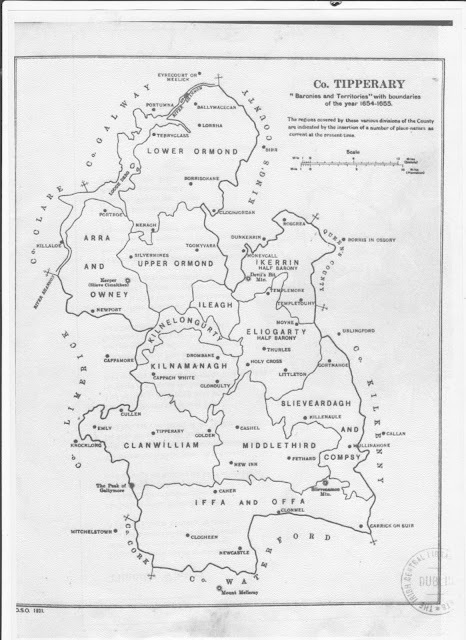 In 1641 in the Down Survey William Fanning of Upper and Lower Ffarrenrowry owns lands. 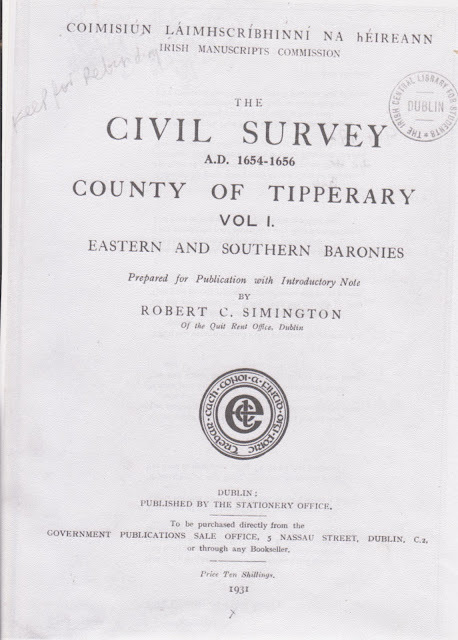 1654-56 In the Civil Survey the castle at Farrinrory is inhabited by William Faninge, gent and papist. 1654 William Ffanninge of Farrenroe has been issued a certificate of transplanation. Even though death was the punishment for not leaving I have read that the transplantation scheme was a bureaurocratic nightmare and not everyone left for Connaught, some stayed on without their estates. In the Hearth Money Rolls 1665-67 a David Fanning de Fearanrory has one hearth and 2s. 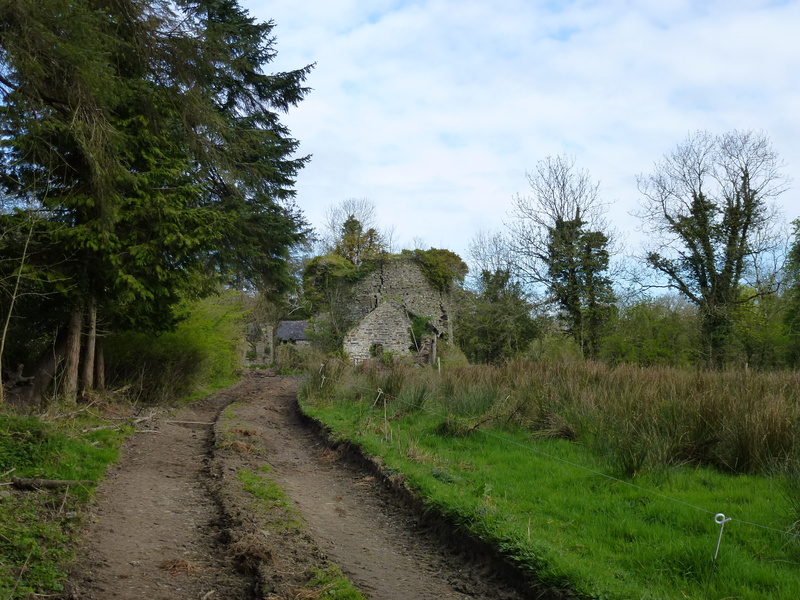 1670 the lands of the Fannings at Farranrory are owned by Sir George Ingoldsby, Earl of Anglesey, Protestant. He most likely got it from Ltn Jessy. 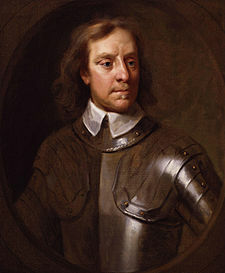 While the soldiers of Cromwell were rewarded with land many sold their estates on. Farrenrory Castle is described in the Ordinance Survey Letters by John O’Donovan. These letters are now online at Ask About Ireland. 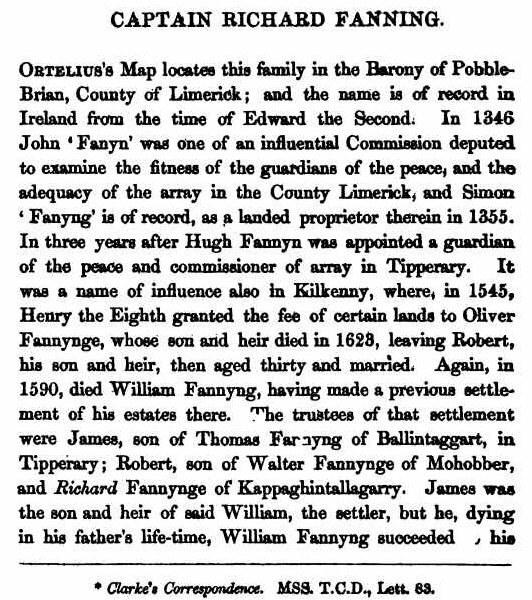 William Fannynge of Farranrory and Kilkenny died in 1590. 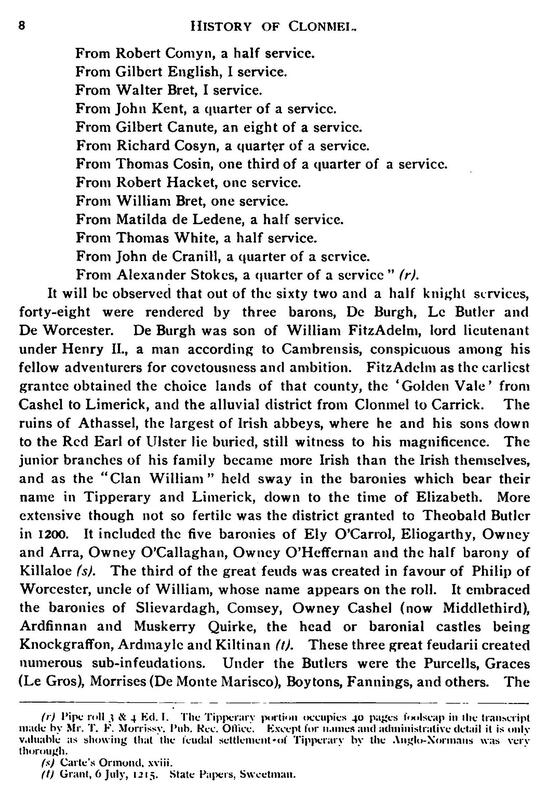 (From History and Antiquities of Kilkenny William Healy). 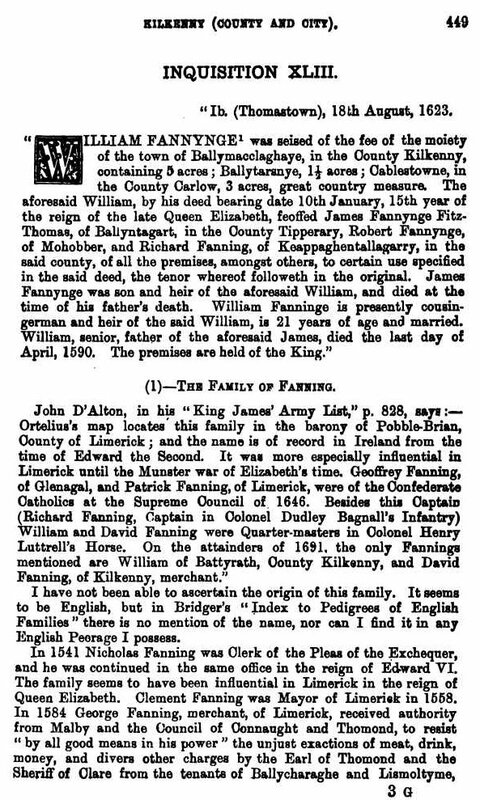 In John D’Alton’s book “Illustrations, Historical and Genealogical of King James’ Irish Army List” 1861, William Fannyng who died in 1590 is described as “the settler”. 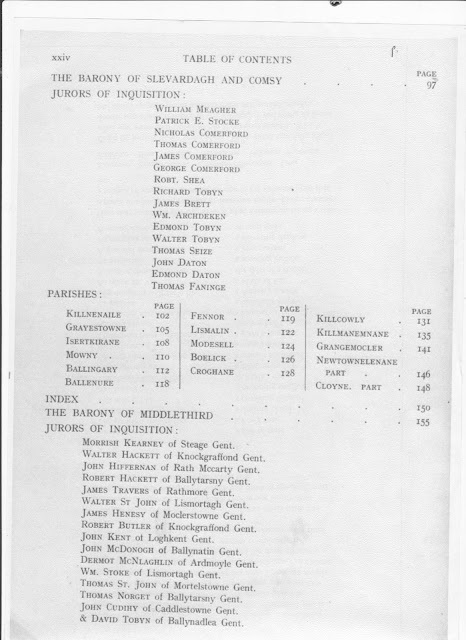 It seems that these Fannings who lived at Farranrory originally came across from Kilkenny. 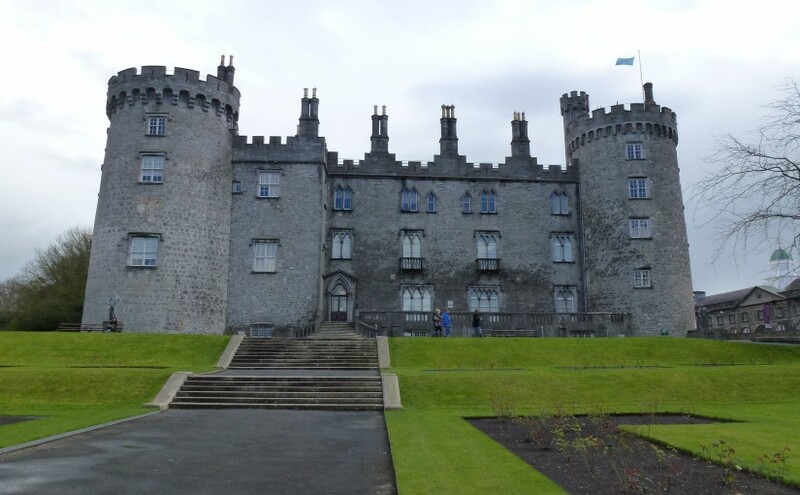 I have read that they came to Kilkenny from Waterford, not sure if there is any way of knowing if this is true. I have also seen a family tree which has Edmund, the brother of William Fanning of Farranrory who died in 1590, being the the Edmund Fanning who settled in Connecticut. Again, who knows? 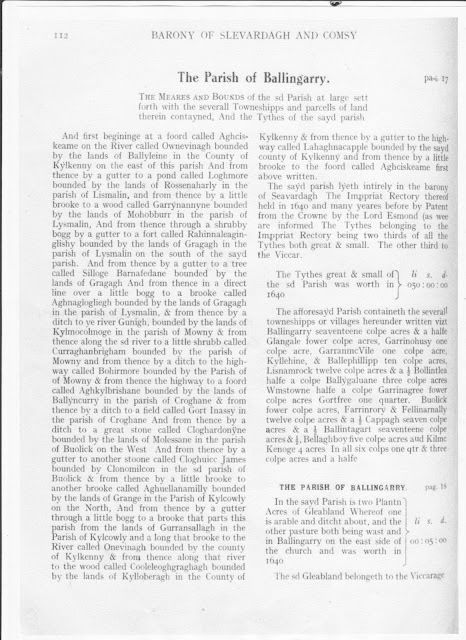 “Ballingarry History The Fannings, Lords of Ballingarry“ by Michael J. Fitzgerald on Ballingarry.net also has more information and stories of the exploits of the medieval Ballingarry Fannings. I asked around in Ballingarry and was directed to the house of Martin Maher who I was informed by a local man in the street “is into all that crarp”. 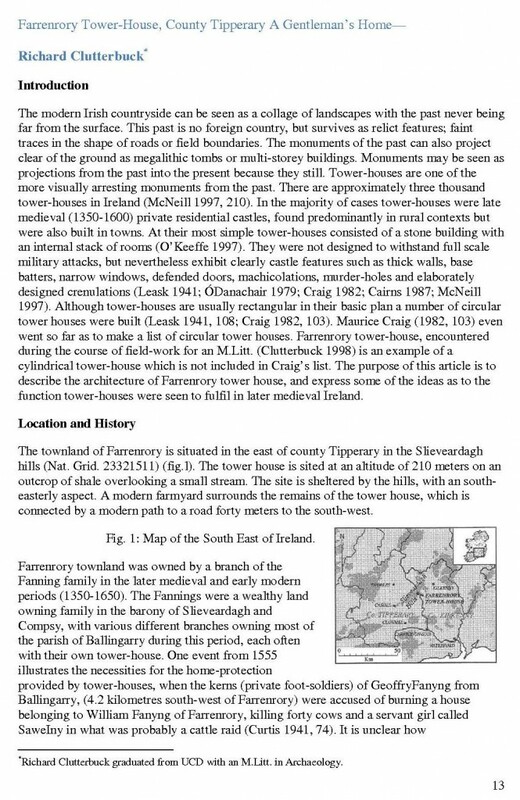 Martin was very helpful and assured me that there is nothing left in terms of buildings associated with the Fannings in Ballingarry or Mohober but that at Farrenrory there is a round towerhouse in Pollard’s Field. After getting lost the usual number of times we found it. The castle was up a drive and just visible from the road. It was unfortunately surrounded by layers of mud and cow poo which we sank into. Afterwards we went to visit a fourth cousin and had to turn up in our socks. Although, they being farmers didn’t seem to mind. “Where there’s muck there’s money ” they told us. 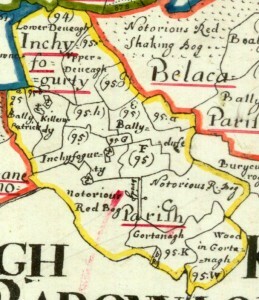 The townland of Farranrory was owned by William Fanninge of Farrenrory, son of James Fanning according to the pedigree above, in 1641 recorded in the Civil Survey. It was described as a good little castle with a good thatched house and some cabins. In the Down Survey 1655-6 it is depicted along with five houses surrounding it. Farranrory became the property of Lieutenant William Jessy of the Cromwellian army, who is recorded with two hearths in the Hearth Returns for 1666/7. He was most likely an absentee landlord. 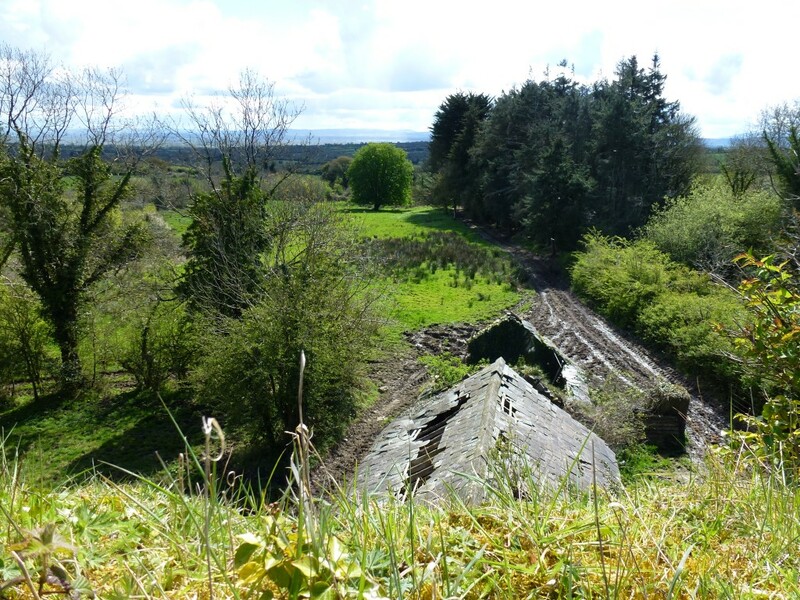 “Location: Farranrory is situated in the east of Slieveardagh on the hills overlooking the Munster River Valley. 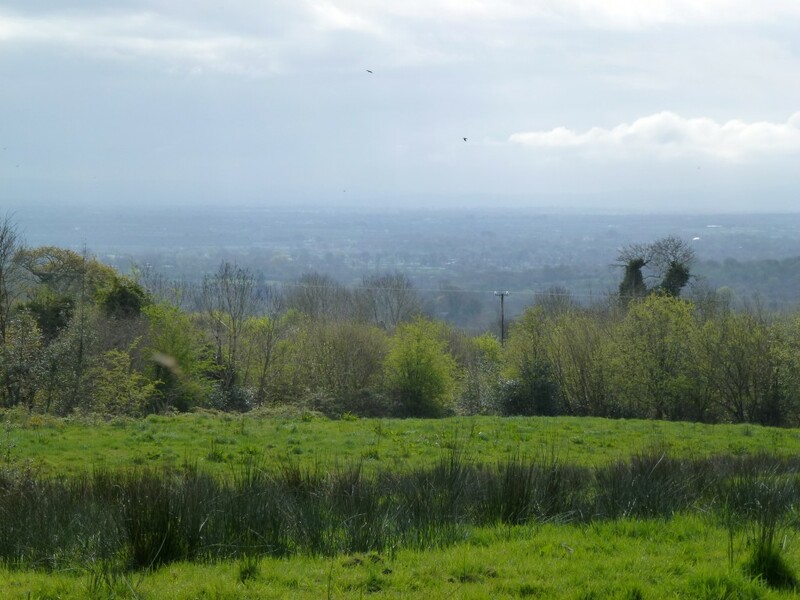 The land is used predominantly for pasture today and was estimated to be mostly pasture in 1654 (Civil Survey I, 115). 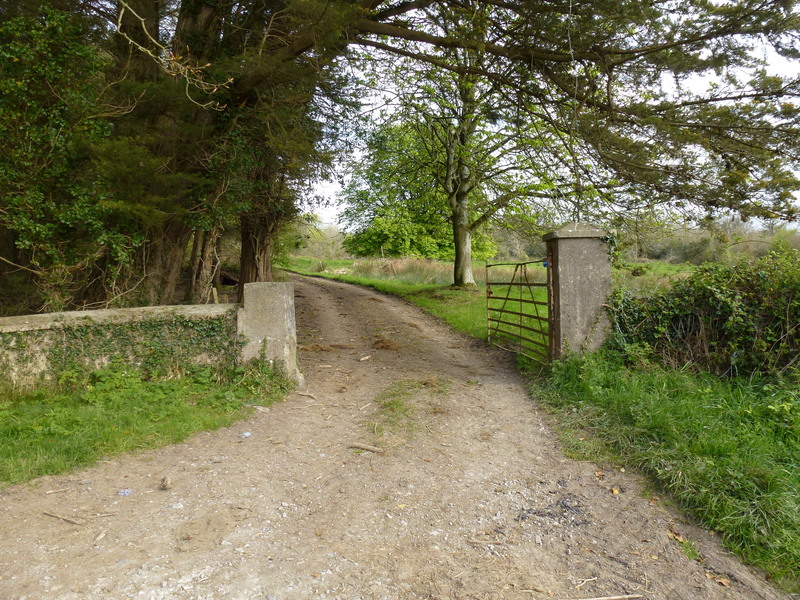 The site is approximately 4.2km northeast of Ballingarry parish centre. 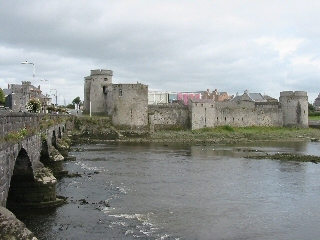 Farrenrory castle is sited at an altitude of 210 metres on ground sloping gently to the southeast. The site has a south-easterly aspect and is sheltered by the hills. A small stream tributary of the Munster River runs approximately 40 metres to the east of the tower house cutting a small valley in the shale bed rock. 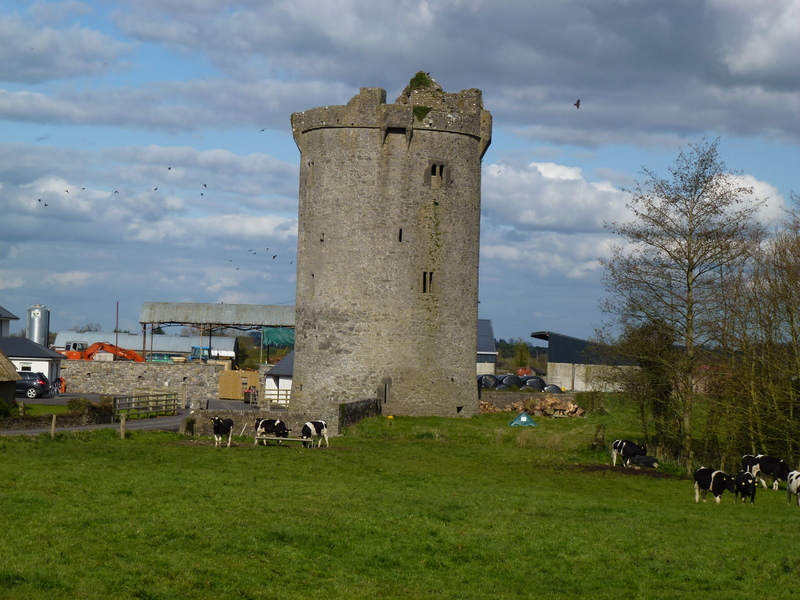 The tower house is 190 metres north-west of a road which runs east-west into Co. Kilkenny. A lane connects the site to the road and probably served the original settlement and the modern farm yards and houses as well as continuing up the hill as a lane to the fields. 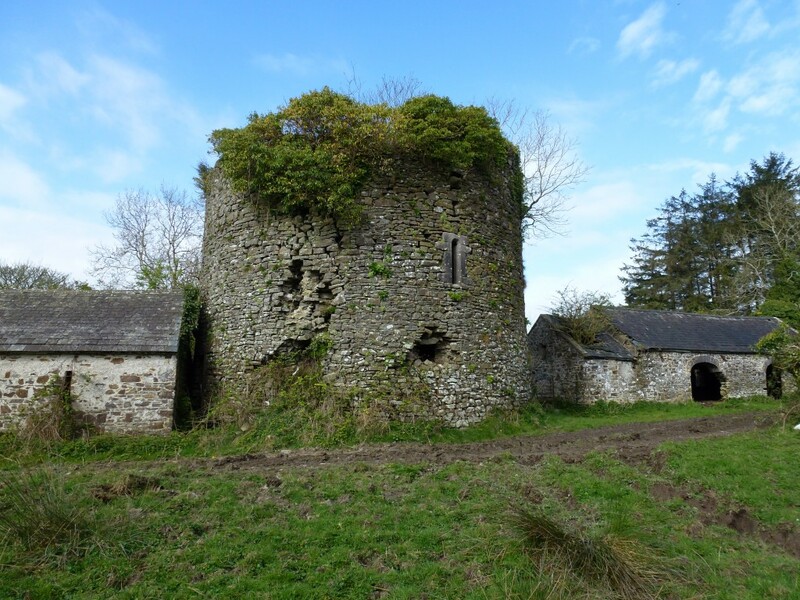 Description Farrenrory Castle is a free standing tower house with a circular plan. 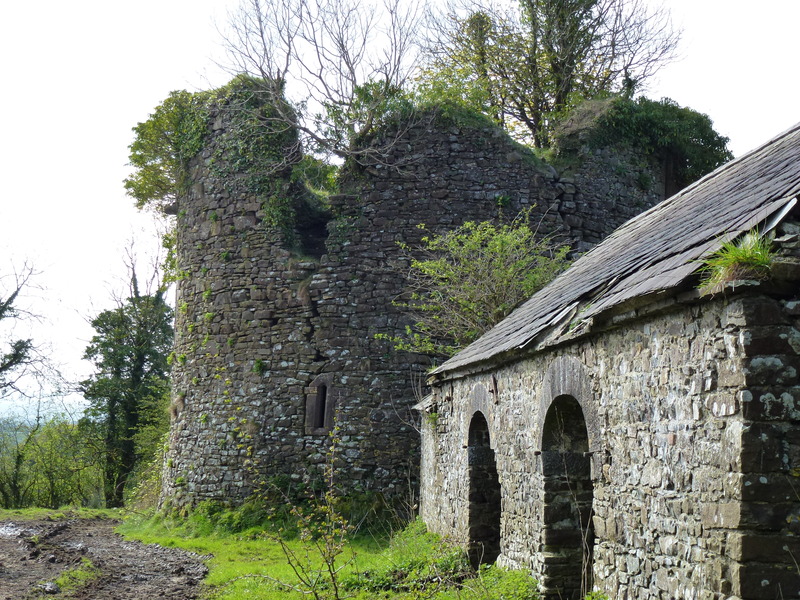 The castle is constructed of coursed limestone surviving to the level of the second floor above which it is derelict. The interior has mural chambers (vaulted chambers in the thickness of a wall), stairs and an internal vault. The exterior ground level of the structure has a very slight base batter (thicker at the base). 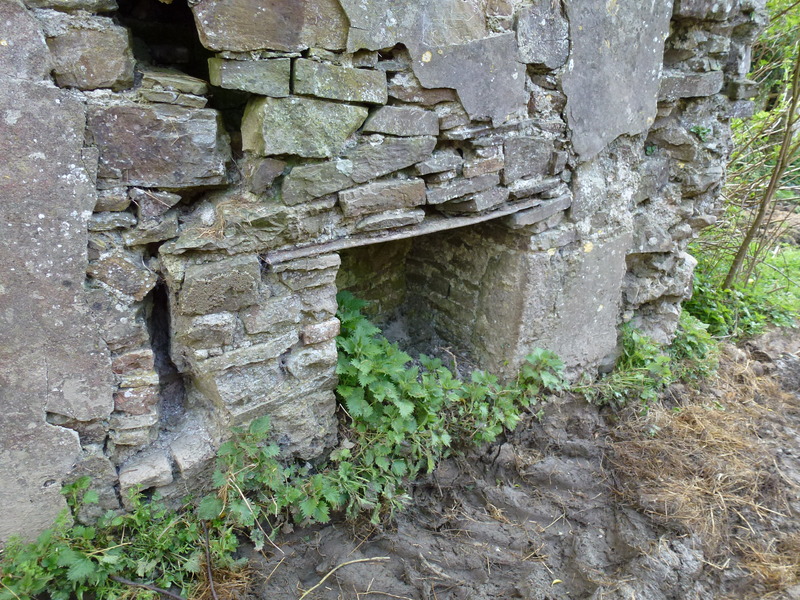 The gable of a derelict farm house is attached to the west side of the tower house, partially obscuring the original entrance (Fig. 45, Plate 19). The tower house has a maximum external diameter of 10.4 metres and an internal diameter of 5.2 metres for the main ground floor chamber. Farrenrory survives to an approximate height of 8 metres. None of the original woodwork or door survives in the interior of the tower house and was probably salvaged for a later building. 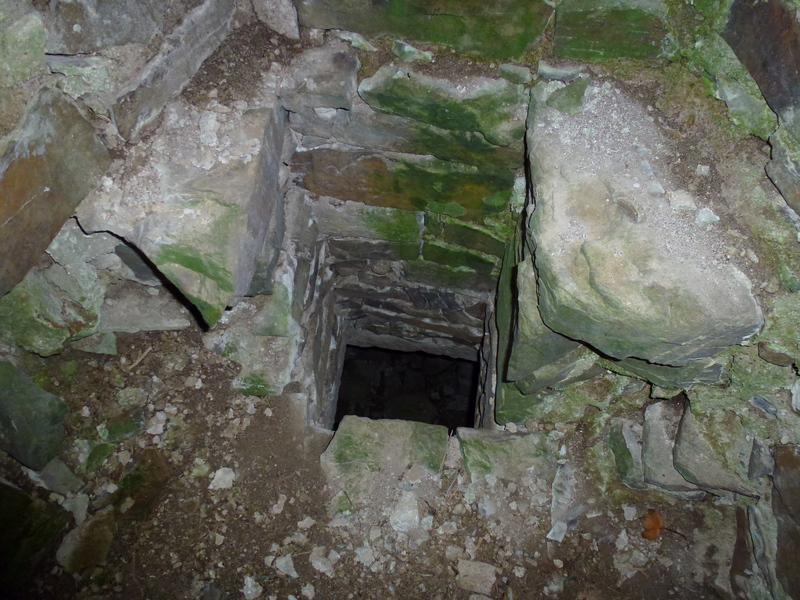 This robbing resulted in the breach in the ground floor embrasure (an embrasure is an opening in the defences of a castle used for shooting at attackers) and also the destruction of the tower above the second floor. 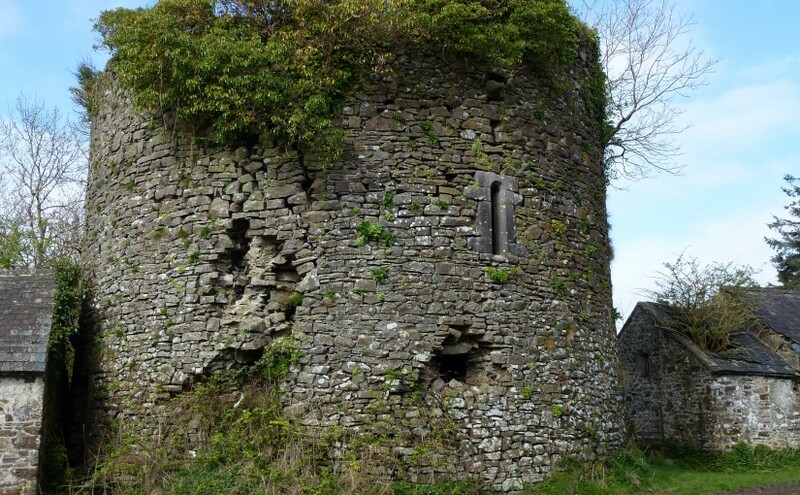 Farrenrory tower house has a major structural crack in its facade and may be in danger of collapse. 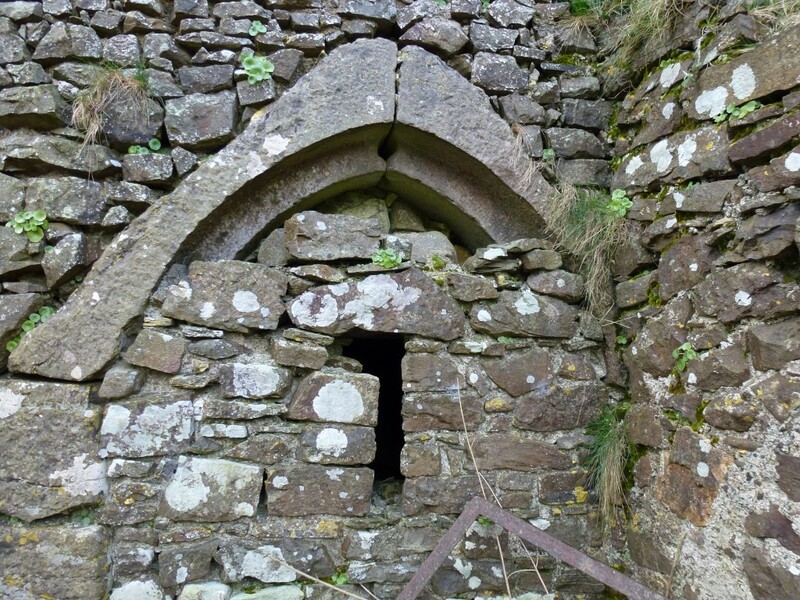 The tower house was entered through pointed-arch cut limestone door located in the western quadrant of the tower. The door frame has two orders one of which accommodated a yett (a gate or grille of latticed wrought iron) held in place by chains through holes in the left jamb and the apex of the door frame. 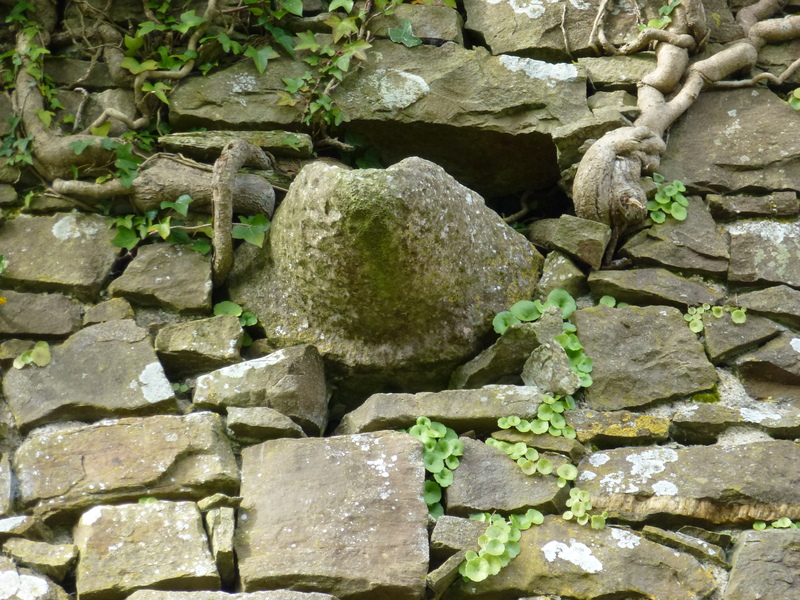 The gable of the later farm house obscures the right hand side of the jamb. Dedication plaque above main entrance, now blocked up. A dedication plaque is set in the wall above the door; unfortunately this plaque is illegible. Presumably is a dedication to the builder and owner of the tower house, probably a member of the Fanning family. The main entrance leads to a small lobby area. Two inward opening pointed-arch doors led from the lobby to a mural chamber and a secondary lobby. 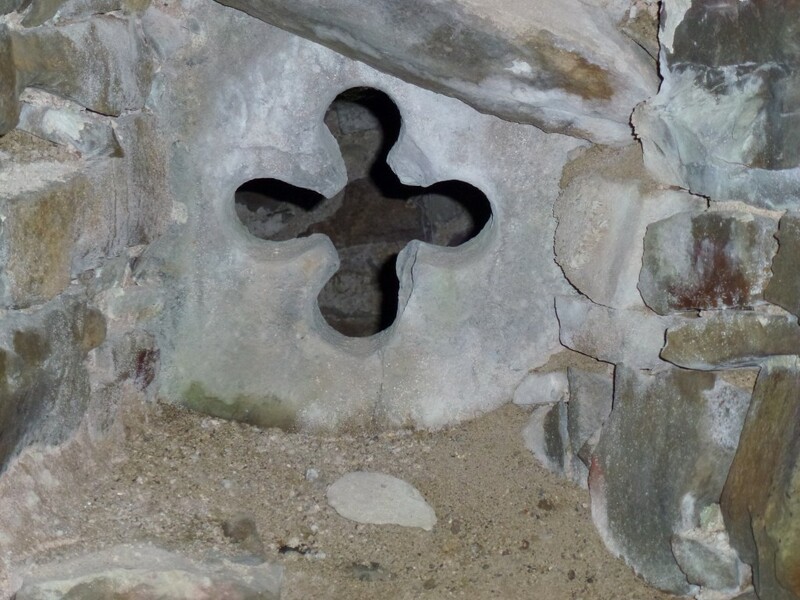 There is a cruciform musket loop with downward splayed expanded terminals directly in front of the main entrance. 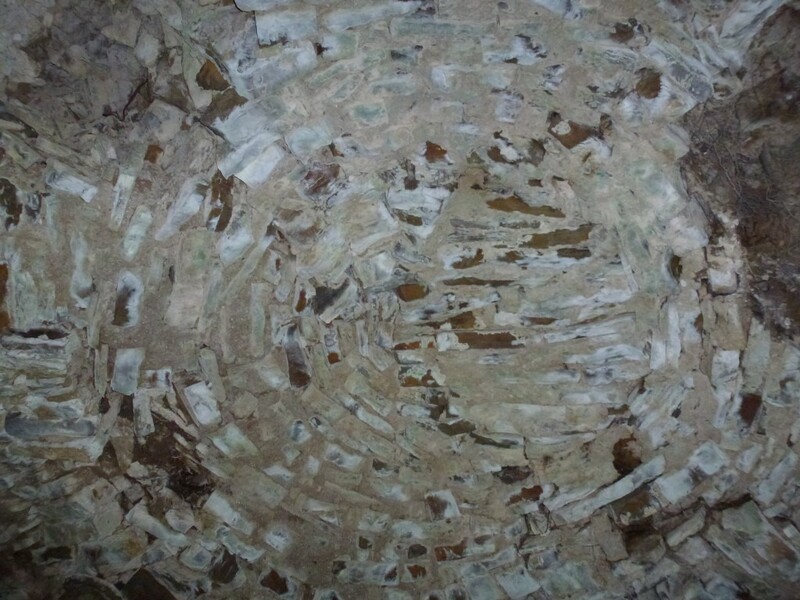 This is set in a single flag of limestone and is reached by a recess in the main ground floor chamber. There is also a murder hole in the lobby ceiling which drops from a mural chamber in the first floor. The small ground floor mural chamber probably acted as a guard chamber or storage space. 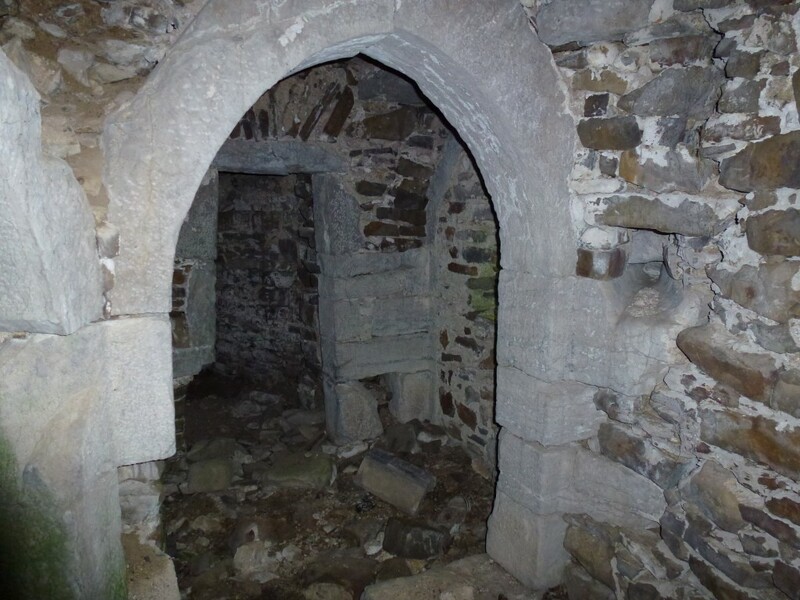 This chamber has a vaulted roof and has two recesses in the walls for cupboard space. The secondary entrance lobby gives access the main ground floor chamber and the vice (spiral staircase) through inward opening door set in pointed-arch limestone frames. The jambs still retain some pivot holes and hanging-eyes for the heavy wooden doors as well as the holes in the jambs for the cross bolts. 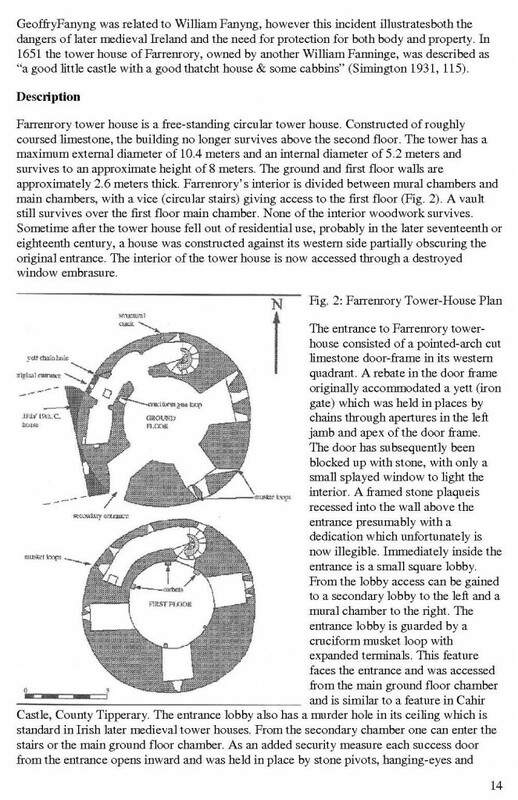 The chain for the yett can also be drawn through an aperture from this lobby. The ground floor main chamber is circular in shape with coursed shale walls and three deep set embrasures for windows. The embrasure in the south-west quadrant has been broken out. 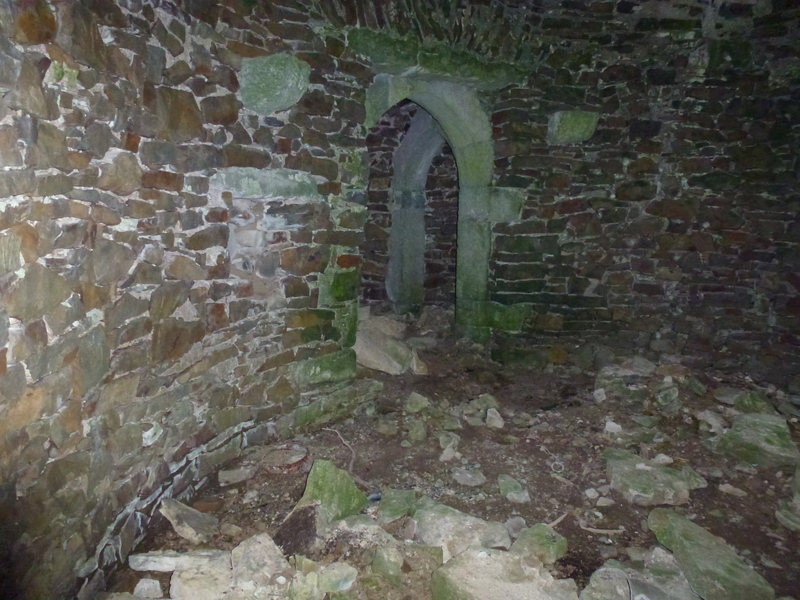 The floor of the chamber is obscured by rubbish and debris from the walls and corbel roof (corbels are stone brackets). The chamber originally had a wooden ceiling. The embrasures are vaulted, still with the impression of the wicker-work centring. 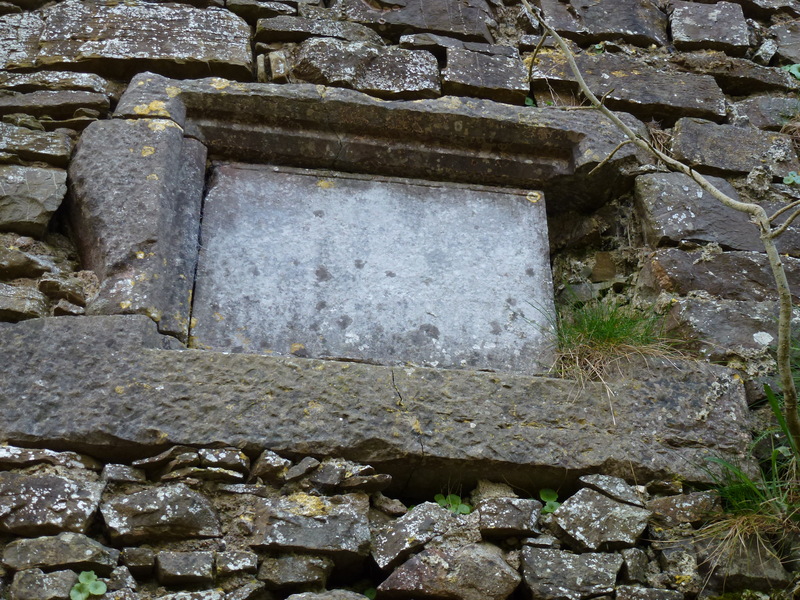 Narrow slit windows are round-headed and constructed of dressed limestone with splayed ingoings. The exterior of the southern light has carved spandrels with a triple-leaf motif. On either side of the lights are musket loops. 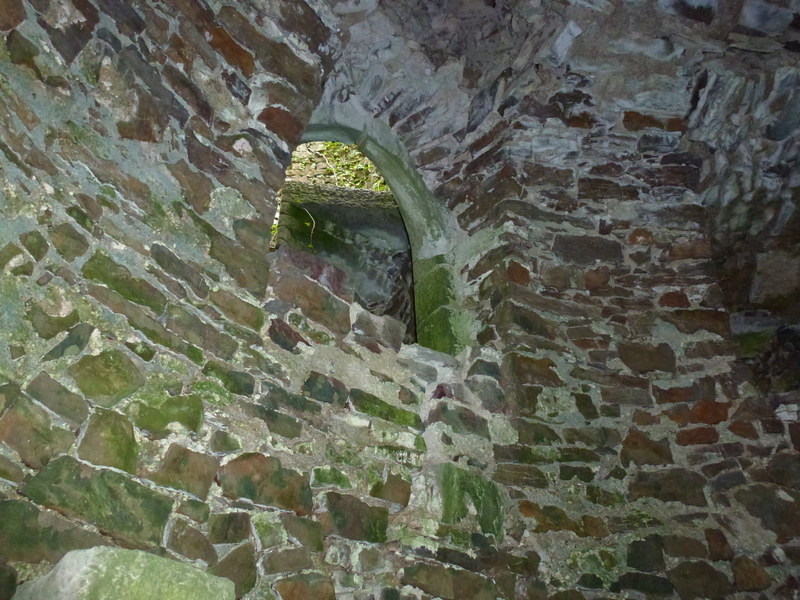 These are deep apertures splayed at an angle to the windows, although their exits on the outside of the tower house have been removed and blocked. Portions of the vaulting of the southern embrasure have collapsed where it corresponds with the first floor embrasure overhead. The vice is accessed through an inward opening segmented pointed-arch door from the secondary lobby and was lit by a single narrow window. The first floor was reached through a pointed-arch door directly off the vice. 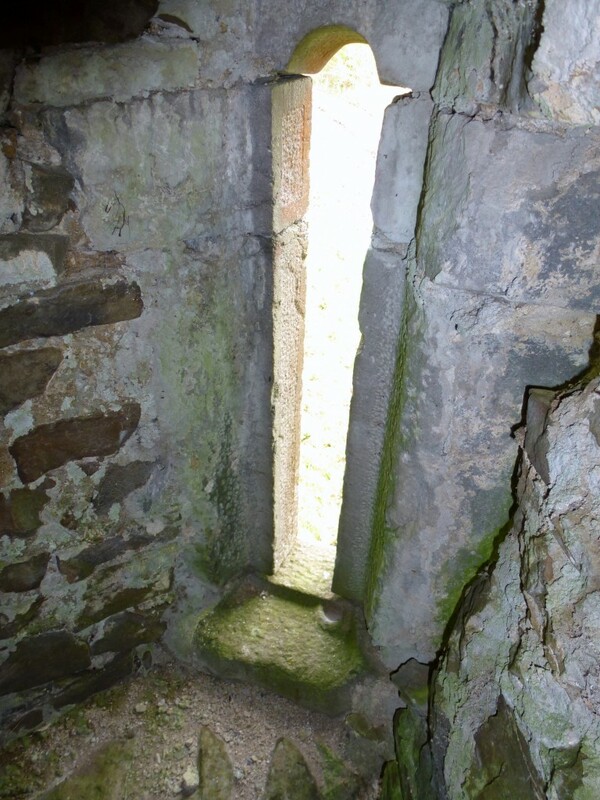 A mural passage (a passage in the thickness of a wall) from the vice leads to the chamber with the murder hole. 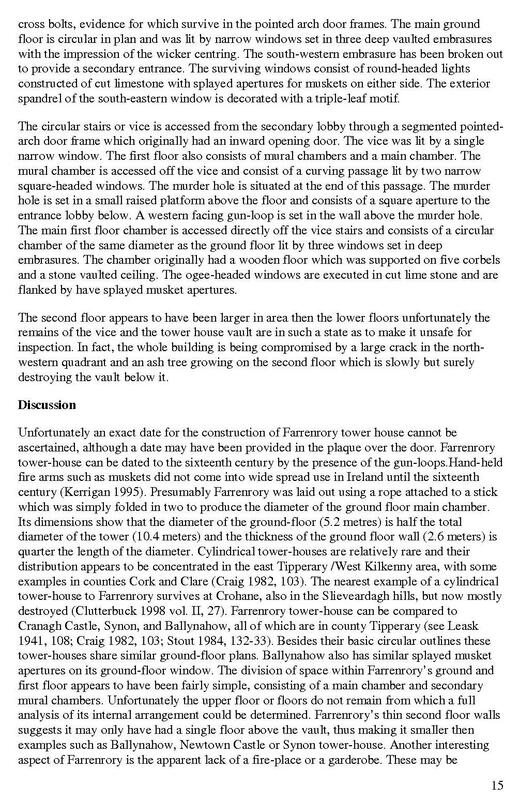 The passage is lit by slit windows and has a small gun loop next to the murder hole over the ground floor main entrance. The wooden floor of the second storey was supported on corbels. 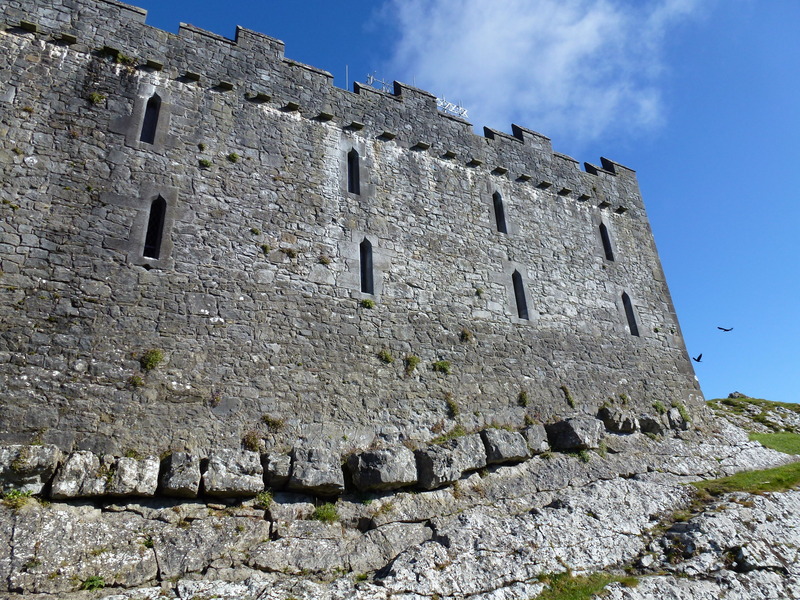 The floor has three deep embrasures each with narrow ogee-headed windows of dressed limestone. On each side of the lights are apertures for gun loops. These pierce the wall as small circular holes created by two shaped pieces of limestone. The first floor has a vaulted ceiling which is now in a dangerous state of repair. 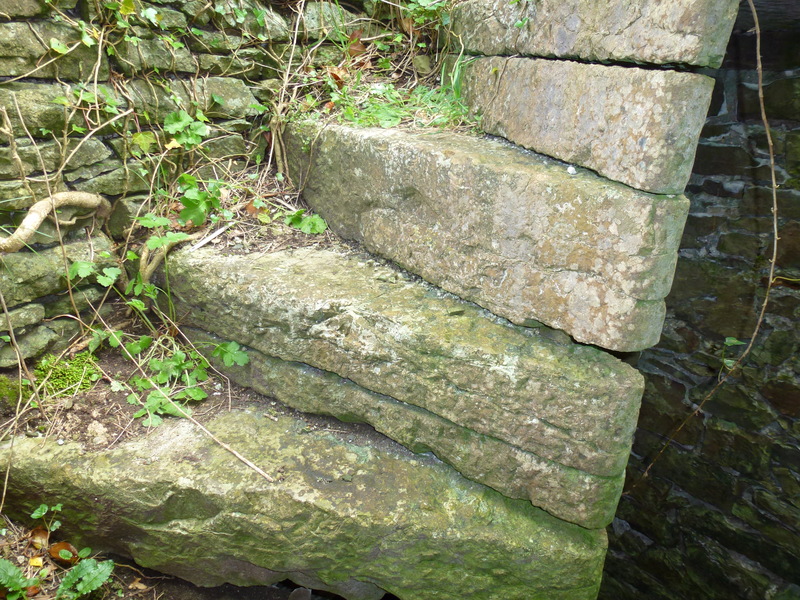 The second floor can still be reached by the remains of the vice though some of the steps have been removed. This floor as too dangerous to inspect but appears to have been larger then the lower floors. The original walls partially survive and contain the remains of a number of windows around its circumference and a slop stone on the north-east side of this floor. The remains of the second floor are obscured by the growth of grass, ivy and a tree. The tree is probably destroying the internal vault with its roots. Richard Clutterbuck’s article on Farranrory tower house from Trowel printed with his kind permission. 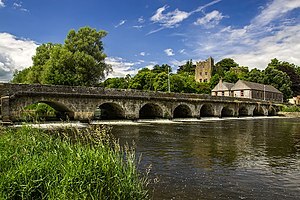 I don’t know if there is any connection between my Fanning ancestors and those at Farrenrory as there are no records after about 1680 to make any connections. 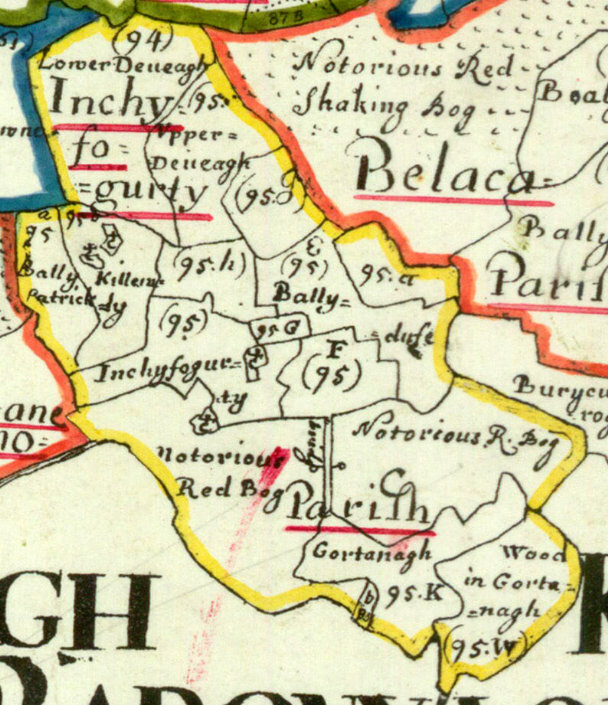 There don’t appear to be any Fannings living in the Ballingarry area today or during the 1850’s (Griffith’s Valuations) and they may have moved to the Thurles area. 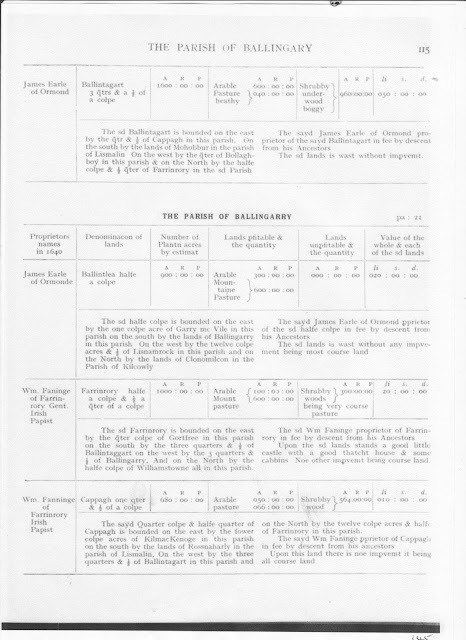 There is mention made on the Ballingarry.net site of a Mr Fanning setting aside land for the new Ballingarry Church before he sold his land to Mr Jacobs. The new church was built in 1731 so there was a Fanning around at or just before this time. 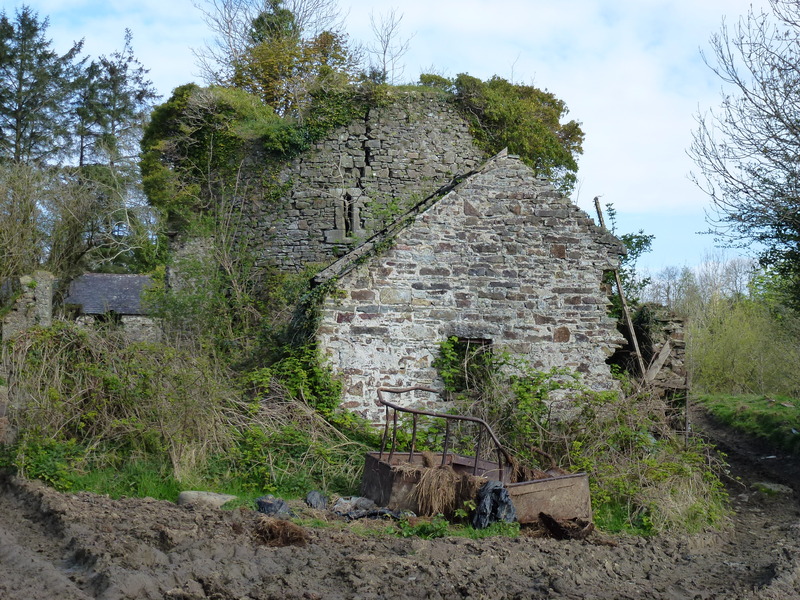 The Fannings who lived at Lissaroon are said to arrived there in 1741 but from where we don’t as yet know. 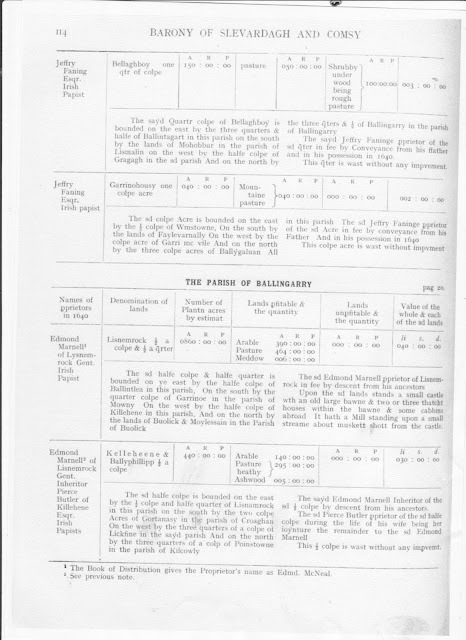 Perhaps some one reading this may know what happened to the Ballingarry Fannings. Certainly in our family the names William and Edward appear frequently. It was a highlight of my time in Co Tipperary climbing around this castle. The first time we were there it was raining and I discovered that all the photos I took had a big raindrop in the middle, so we had to go back the next day. This time armed with gumboots (in Ireland they call them wellingtons) kindly lent us by Eileen Creed our Cashel B&B (Ard Ri House- highly recommend) host and her husband. It was also a lovely sunny day so much more enjoyable. I loved the land around the castle, very pretty and protected, my kind of place. 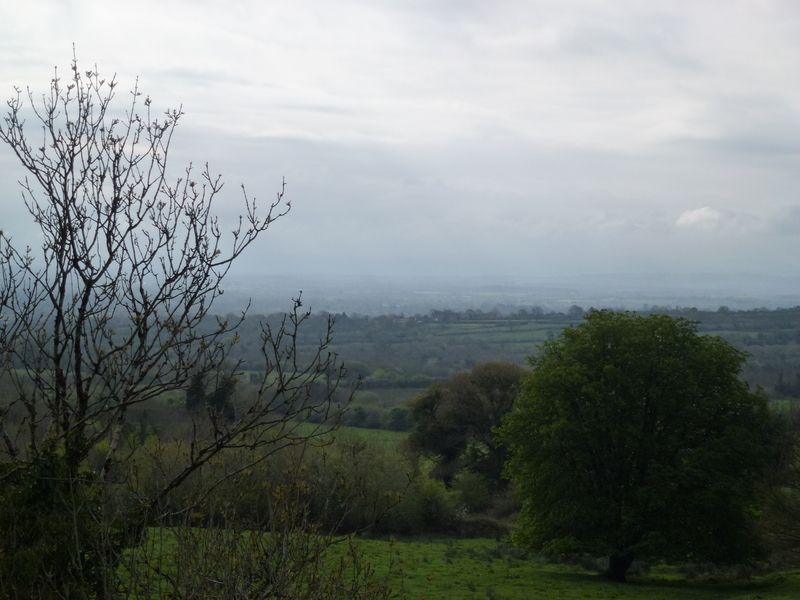 We climbed up on top and sat up there and surveyed the surrounding countryside and imagined what it must have been like living there. While exploring the castle ruins it was great not to have to worry about snakes !! Thank you St Patrick. At home it would be highly prized snake habitat. To be honest we didn’t see a lot of wildlife in Ireland and Spain compared to back home which is a bit sad. I guess centuries of occupation have taken there toll. The downside of all that history. At least while driving around Ireland I got a break from seeing roadkill which is so prevalent on my drive to work on the Pacific Highway in NSW. 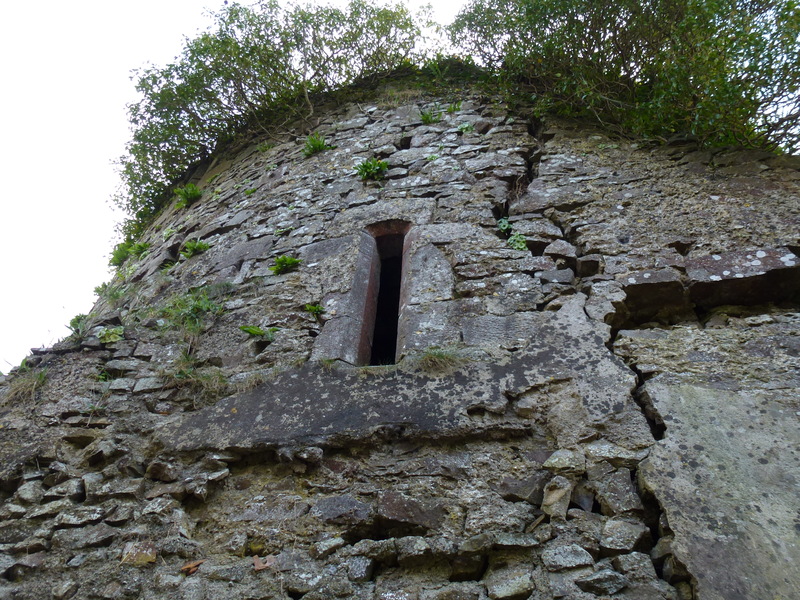 Ballingarry Fanning Castle Farrenrory, the garderobe or medieval toilet which emptied down to the outside of the castle. Back of the castle, toilet waste exit?